It occurred to me, as I was writing this, that maybe I should be writing under a nom de plume and not reveal my location. You see, I work at a library where we perform a service that is illegal in Pennsylvania, Minnesota, and probably some other states. Luckily, we aren’t in those states… But you never know who’s gonna try to implement a law next! It seems a library in Pennsylvania admitted to having a seed library and received a legal order to stop what they were doing. No, we’re not talking about marijuana seeds or anything that controversial, just plain, old flower and vegetable seeds. While saving and sharing your seeds seems perfectly innocent, there are actually other libraries in the United States and other countries that have ended up in trouble with the law for such endeavors. In 2014, a library in Mechanicsburg, Pennsylvania worked in partnership with the Cumberland County Commission for Women to start a seed library within their facility. They obtained information from the Pennsylvania State Agricultural Extension office to start the program. But then they received a letter from the Pennsylvania Department of Agriculture stating that they were in violation of the Seed Act of 2004. Who knew! First jaywalking and now this? But while this seems like a joking matter to some of us, the Department of Agriculture felt it was so serious that they sent a high-ranking official and lawyers to a meeting with the library. When I first heard of this, my first thought was that this was some plot on behalf of the seed companies so that they wouldn’t lose money from so many people sharing seeds for free. However, I found that the USDA’s fears are based on the idea of botanical bioterrorism! And here I thought poison ivy and kudzu were the worst botanical terrorists there could be. The Seed Act of 2004 mainly focuses on the selling of seeds, but there is also a concern about seeds that might be purposely or accidentally mislabeled, the growth of invasive plant species, cross-pollination, and poisonous plants. The Department of Agriculture told the Pennsylvania library director that the library staff would need to test each seed packet for germination and other information if they were to continue to provide the seeds. The library ended up discontinuing its seed library and, instead, sponsoring seed swapping days in order to avoid any legal ramifications of actually being responsible for the seeds themselves. Practically the same thing happened with a library in Minnesota, except there, the seed officials showed up in person. Library staff there were also told they had to discontinue their seed library. But good news folks! 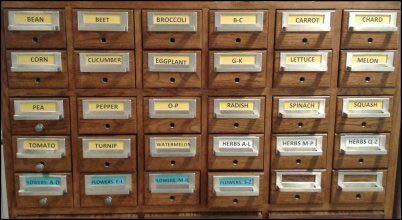 If you don’t live in Pennsylvania, or Minnesota, there are lots of places in other states that seem to be getting away with having their own seed libraries. Just check your state and local laws. During the time of the problems in Pennsylvania and Minnesota, there were already at least 300 across the U.S., so it never occurred to them that it would be a problem. To learn about your state’s seed laws, visit the American Seed Trade Association website. The site features a map of all states, and when you click on a state you can read its own individual seed law and whatever restrictions there may be. So, With All This Drama, What’s the Point of a Seed Library? Many gardeners are already ordering seeds and planning for spring. And still, others are alloecwing a few of their plants from each crop go to seed instead of picking the fruits or veggies from them, then saving those seeds for next year. Why bother when it might be easier to simply buy more seeds in the spring? Well, other than saving money and a trip to the store, many feel there is more guarantee that seeds collected from plants that they already have and know are healthy, will also be healthier, and seeds adapted to their soil and climate, not to mention local pests, will be even more robust. 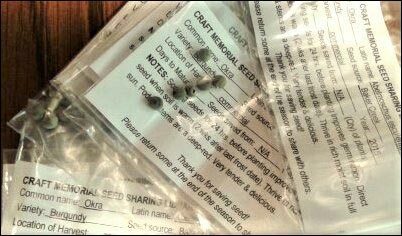 Our local library has taken this idea one step further by helping patrons share those healthy acclimated seeds. Now the “book” library also contains a seed library made up of heirloom seeds that can be “checked out” by anybody who has a library card and signs up. As a way of getting started and enticing participation, our library gained donations of heirloom seeds from such companies as Baker Creek, Seed Savers Exchange (SSE), and Southern Exposure Seed Exchange (SESE). 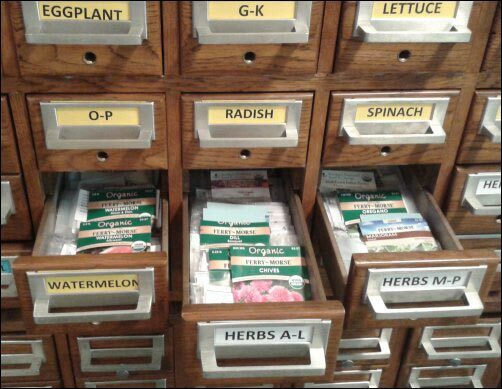 The library now has over 100 varieties of heirloom seeds for vegetables, herbs, and flowers. There is no charge for the seeds, but it is hoped that people will gather seeds from their crops at the end of the summer and donate some back to the library in order to continue the tradition. The focus is on heirloom seeds because seeds of crossbred plants will not “remain true”, meaning that they won’t turn out the same as the original plant, but seeds from heirloom plants can be gathered and used from year to year. Thus, while the seeds checked out this season will be heirloom varieties, they won’t be as adapted for this area yet. The ones donated in future years will become more and more and hardy. Other reasons for seed libraries are to preserve seeds that have not been genetically modified, since there is growing concern about what effect GMO foods might have on our health, in addition to fears about its effects on the environment. NOTE: I am using words such as “concern,” “theory,” “idea,” etc. in this discussion because I don’t feel that I have explored both sides of this highly-debated science extensively enough to feel confident about taking a side. I’m just putting these ideas out there for your consideration. Many feel that GMO seeds will destroy the food chain because they often contain pest-control features which could result in the reduction of insects that are part of the food chain, thus diminishing that insect’s predators, and then the predator’s predators, and so on. Then there is the fact that we rely on good insects, such as honey bees, to both fertilize our vegetables as well as produce honey; both are a part of our own food chain. For some of us, money is the biggest factor. Sometimes you don’t need all of those seeds they sell in those packets and the packets can be pretty expensive if you buy enough of them. Why not share and share alike, so we all save a few pennies? While genetically modified seeds are developed to yield the biggest and best fruits and vegetables, they are often hybrids, so the seeds of the plants they produce will often not remain true, meaning that your next crop won’t look the same as the previous one. It will revert back to the original, lower-quality strain it was hybridized from. There are also issues regarding the patents on the seeds. However, heirloom seeds saved at the end of each growing season and replanted the next year become acclimated to the same area year after year, and will become stronger and better each year. Here is one more scary theory about GMOs. Since most GMO crops are engineered to tolerate a certain type of herbicide, the weeds these are supposed to kill are building up a resistance to the herbicides and coming back bigger and stronger and then needing more toxic pesticides to kill them. Wow, I guess when you think about how we develop vaccines for the flu each year and then have to create new versions because the disease mutates, it all makes sense. Oh, the Stories We Hear at the Seed Library! Those who are interested in preserving heirloom seeds are often those who are interested in preserving history. They may want to carry on their grandmother’s favorite rose or a treasured, old, apple tree from their parents’ homestead. Maybe they feel those pumpkins grown from a specific strain of seeds are the secret ingredient to the wonderful pumpkin bread Mom made when they were young. We’ve been hearing lots of stories from our patrons at the library who have brought seeds to share, and we’ve enjoyed their enthusiasm as they’ve told us how proud they are of the huge pumpkins they grow each year with their special, family seeds. We’ve also been seeing a lot of young couples selecting seeds for their first home. It is almost as if they are more than just seeds; they are hope and potential memories. During the weeks following my father’s death, I spent a lot of time going through old framed pictures, documents, and photo albums at his house. In one album, along with my grandmother’s passport from Hungary, which enabled her to enter the United States through Ellis Island in the early days, I also found a yellowed, letter-sized envelope labeled “Hungarian Paprika Seeds”, and within were folds of tissue paper with about a dozen dried seeds in each fold. I imagined my grandmother coming to America to marry the man she had met when he visited his own relatives in Hungary a few months before. Imagined her tucking envelopes of seeds into her suitcase so she could carry on her gardening tradition from the old country. Then I wondered if those seeds would still be viable if they were really brought over in the 1920’s. Maybe they were sent over later. Maybe she saved them from her own garden in America. Nevertheless, as far as I could figure, they had to be at least 20 years old. My endless curiosity lead me to the internet in search of how old a seed can be and still be viable. Apparently the oldest mature seed that has grown into a viable plant was a Judean date-palm seed about 2,000 years old, recovered from excavations in Israel. It was germinated in 2005. Amazing! Some seed companies that are capitalizing on the idea that we will eventually have some sort of apocalypse, either zombie or otherwise, sell “survival seeds” which they say can last up to ten years because they have been dried in a very precise way. Drying methods do apparently make a difference. Also, I found that germination is not an on/off state, as if all seeds in a pack go bad at once. 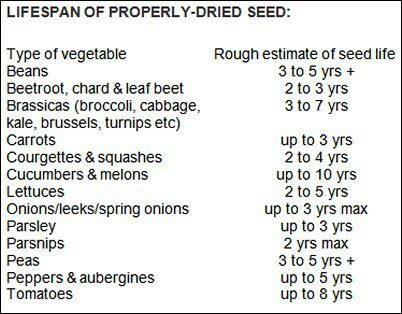 As seeds get older the percentage that germinate will start to drop off, and then at some point will fall to zero. Now that I think about it, I probably tossed a dozen of my grandmother’s paprika seeds into those pots and only got a few plants. So, back to the companies selling seeds for the apocalypse. These companies say that properly dried seeds still have a 50% germination rate after 15 years. But then, how are you going to maintain a proper vegetable garden with zombies stomping through it all of the time? According to information from a U.S. Department of Agriculture website, seed is best stored through the winter at 50 degrees and at 50 percent humidity. A good way to store unused seed packets is to place them in a sealed jar with powdered milk or rice at the bottom to absorb moisture. Store your seed jar in the refrigerator or a cool area such as a basement. There is an excellent book on seed saving titled The Manual of Seed Saving: Harvesting, Storing and Sowing Techniques for Vegetables, Herbs and Fruits by Andrea Heistinger. In it, she gives detailed collection and storage methods for seeds from different varieties of plants. She explains how to set aside a few plants each year and let them go to seed, and then how to harvest the seeds. How easy or hard it is to collect seeds depends on the particular plants you are collecting them from. Some are as obvious as tearing a bean-like pod apart and skimming the seeds out, while others may require soaking until they ferment, or using a sifting device to separate them from the husks and hulls, or sometimes just a little breeze will do the job. They separated wheat from the chaff in the early days by tossing it in the air so that the wheat seeds fell more heavily to the ground while the chaff (extra stuff), blew away on the wind. This reminds me of a memorable scene in movie, but I can’t remember the name of the movie. It was a beautiful scene: women wearing long skirts and white blouses with scarves on their heads, standing in front of a pretty red barn, tossing the wheat into the air, the chaff floating on the breeze, the sunset in the distance… What the heck was that movie? But, seriously, seed libraries are awesome. I’ve never felt like I could afford to buy very many packets of seeds, but now I can get them free and return a few at the end of the summer, though I’m not obligated to do so. Everyone understands that it’s not always possible to save and return your seeds, especially in the first year. In addition to small libraries like ours, where we might have 20-30 people borrowing and sharing seeds, there are also some very large, commercial-type seed-sharing businesses, like the ones that donated seeds for our library to get started. Most of these offer opportunities to become involved in the saving and sharing process either through donations of money or seeds. Others may purchase seeds from farmers, giving them an opportunity to make some extra money. Southern Exposure Seed Exchange is able to operate on a larger scale without fear of government intervention because they store seeds in climate-controlled areas and they perform their own germination-testing in order to ensure it meets both federal and Southern Exposure standards. Test results are printed on the packet to help you determine planting density and quantity needed. Southern Exposure is located on a 72-acre farm between Richmond and Charlottesville, Virginia, they work with over 50 small farms across the U.S. who provide the seeds, and they are always willing to take more. Cha-ching! Sounds like opportunity knocking!